TV show dates: March 13, 2018 — May 15, 2018. 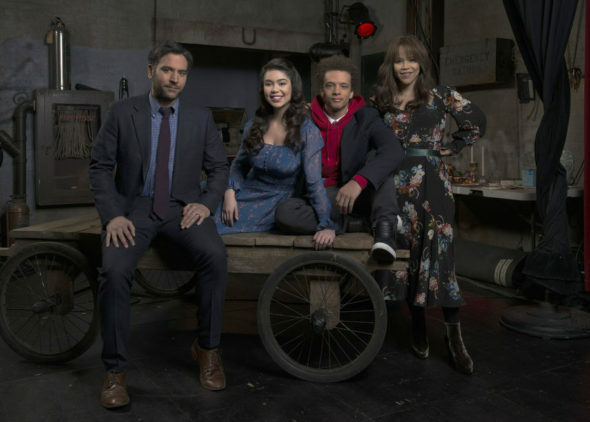 Performers include: Josh Radnor, Rosie Perez, Auli’i Cravalho, Damon J. Gillespie, Marley Shelton, Rarmian Newton, Ted Sutherland, Amy Forsyth, Casey W. Johnson, Taylor Richardson, Joe Tippett, and Shirley Rumierk. Based on the Michael Sokolove book, Drama High, the Rise TV show comes from creators Jason Katims and Jeffrey Seller. The drama centers on Lou Mazzuchelli (Radnor), who is the fictional analogue to the real teacher from the book, Lou Volpe. Although he is committed to his students at Stanton High School, Lou knows he needs to shake things up, in order to rekindle his passion for teaching. To that end, he petitions to direct the school’s theater program, but soon realizes he has enlisted for a whole lot more than he originally expected. By changing the musical to the provocative “Spring Awakening,” and casting performers other than the usual subjects, Lou stirs up controversy that doesn’t end at the auditorium doors. The ripple effect washes over not only the program’s assistant director Tracey Wolfe (Perez), and the kids, but also football coach Sam Strickland (Tippett). As the changes take hold, soon the faculty, student body, and even the town residents will find themselves caught up in the new spirit at the school. The drama explores the idea of finding inspiration in unexpected places. What do you think? Do you like the Rise TV series? Should this TV show have been cancelled or renewed for a second season on NBC? I cannot believe it’s cancelled!!! I’ve been waiting thinking it just seemed soooo long for the new season to start, because it was so GREAT!! I’m truly so disappointed!!! I am so disappointed & disgusted that this show was cancelled. If only people watch it, it will open up their minds to some of the problems that families are faced with nowadays & the best way to handle them. Linda Campbell This is one of the best shows on TV. I don’t understand why it was cancelled and I sincerely wish they would bring it back. I am disappointed that NBC chose to cancel Rise. I thought it was well written and had a believable story line. The family problems could happen in today’s world. I find it hard to believe that the Reality shows have a bigger audience than Rise. Rise is more costly because you have to hire actors and all of the professional people that support them. I loved that show!! Please bring it back. I loved this show. The storyline and acting were incredible. I wish it hadn’t been canceled. Rise was the best new TV show of 2018. After the season of This is Us ended I didn’t think it could be topped, however, I was pleasantly surprised at how good Rise was. After just a few episodes I started to like it even better than This is Us. I know so many more people that feel the same way. I really think that it should be given more consideration. Please reconsider running “RISE” for a 2nd season-people are still petitioning to get this done. Why is it that only decent shows get canceled while these shows that don’t make sense (I won’t name any here as much as I like to) stay on the air !?!?!???? ?